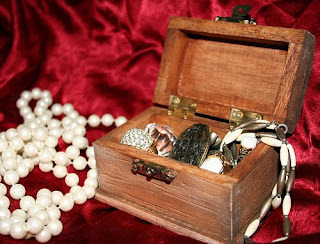 Yes, Jack Sparrow, you can make your very own awesome pirate treasure chest. It's tiny and perfect for your desk top. You can keep your colored staples hidden from co-workers! Read my tutorial on how to transform unfinished wood into the image on the left on my new post for my Geek Fab column at Pink Raygun. If there is interest, I might do a giveaway for one of these. What do you guys think?